Your arthritis doesn't have to slow you down this spring. Gardening, walking and golf are all activities you can do successfully with arthritis. Gardening is a great activity for maintaining joint flexibility, range of motion and quality of life. With a few simple modifications you can continue gardening with ease. Plan to garden during the times of day you feel best. Warm up your joints and muscles with stretches or a brief walk before you begin working. Avoid working in the same position for a long periods of time to prevent stiffness and remember to pace yourself. If you experience severe pain, stop your work and wait until you feel better before continuing. If you have pain the day after gardening, scale back the amount of activity you do next time. Arrange your garden in a way that makes your tasks easier and conserves your energy. Choose low maintenance plants, use helpful tools and utilize simple methods of watering. Spring is the perfect time to begin a walking program. Walking is good exercise for anyone, especially people with arthritis. It's an endurance exercise, which means it strengthens your heart, helps your lungs work more efficiently, and gives you more stamina so you don't tire easily. As a weight bearing exercise, walking helps stregthen bones, reducing the risk of osteoporosis. This is especially important if you are taking steroid medications for your arthritis, which can weaken bones. Walking stregthens the muscles and tissues surrounding the joints; it helps to better protect joints and keep them ready for daily activities. In addition to the physical benefits, walking, like all regular exercise, has psychological perks such as better sleep, weight control and uplifted spirits. It can play an important role in combating the depression, stress and fatigue that may sometimes accompany your arthritis. Golf is another very adaptive sport that can be tailored to meet the physical capabilities of almost anyone. It can even have health-enhancing effects. If you have arthritis, playing golf can keep your upper extremities mobile plus help you maintain hand grip strength. With a few equipment and technique modifications, arthritis doesn't have to slow you down. For instance, using a lower compression ball will allow more "give" when you hit the ball. Using clubs with lightweight graphite shafts will help absorb shock better. Build up the grip size on your clubs with epoxy tape to help you hold them easier and to reduce stress and pain on your finger joints. Try wearing wrist braces and gloves on both hands to stabilize your joints. Most importantly, listen to your body throughout the round. 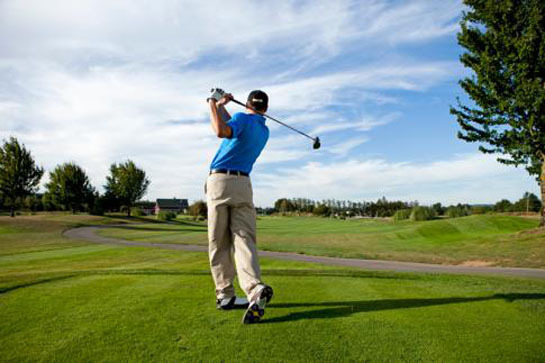 If you begin to tire, practice your chipping or putting, or play fewer holes. Remember to consult your doctor or physical therapist for any precautions you should take involving any of the aforementioned activities.